Pre-wedding photo shoots are a great way to celebrate the last days of bachelorhood and an impending nuptial for the couples. It really gives a breather to the couples, busy in their wedding preparations - a day off in the cozy comfort of each other. Moreover, unlike weddings, which are shot in a traditional setup, pre-wedding shoots allow the couples to be themselves in their casual best in mostly outdoor locations. All the above reasons have contributed to the rise in pre-wedding photography in the past few years. Nowadays, couples are becoming increasingly creative and are incorporating unusual themes in depicting wedding and pre-wedding love story. 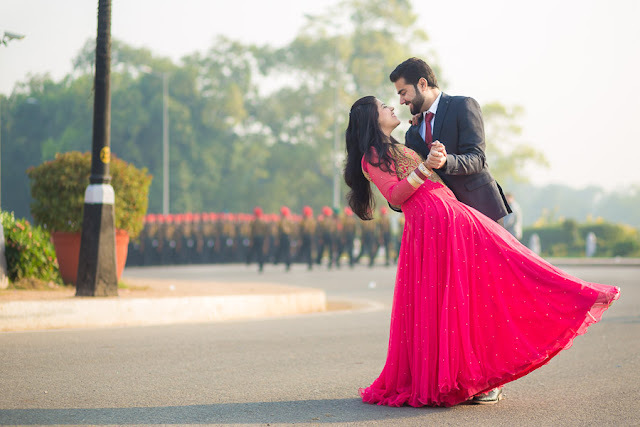 However, if you are falling short of inspirations, ask your experienced professional photographer to suggest a few pre-wedding photoshoot ideas. We are also here to give away some trendy pre-wedding shoot concepts, which can truly take the experience to a whole new level. Candid: This type of photography involves letting the couple do their activities while the photographer shoots them. This is a great way of telling romantic stories of couples. Any general activity like going for a picnic, taking a stroll or a fun-filled cooking session can be the theme of a candid photoshoot. The makeup and outfits need to be as per the activity. In most cases, a simple denim and shirt combo will just be appropriate. Luxurious: This is just opposite to the candid theme. Here the couples show off all things precious – be it their attire, vehicle or the location. The ideal location for this theme is a landmark, which can be either natural or manmade. Think Taj Mahal, Burj Khalifa or Eiffel Tower. Or else, aim for a picturesque backdrop with an unearthly feel to it. Bring out the best outfits to match the location. Lace, velvet, tulle etc. are ideal for showing opulence. This type of theme would require you to pose. So, get some hints from your photographer. Vintage: This theme is gaining more and more popularity among the couples. However, one needs to prepare meticulously to pull off such a shoot. Decide on the venue beforehand. A vintage bungalow, library, museum or even a 1950’s car can give the vibe. If you want to be more experimental, look for an old railway station, a curio shop or even a lonely street with old lights and a horse carriage. Be extremely careful with your clothing, makeup, and hairstyle. If possible, go monochrome to depict the era properly. Bollywood: This is a fun way of doing your pre-wedding photoshoot. Select the iconic 1970’s style to make the most of it. Include psychedelic prints, bellbottoms, wacky wigs and poufs in your getup. For the location, a lovely garden full of blooms will be ideal. Use props like colorful umbrellas, oversized glasses, bicycles and vintage scooters. Watch some popular masala movies from that era for more inspirations. Boho-chic: Want to be different from the rest? Try boho. These photos look amazing when captured with a rustic background. Choose a colorful graffiti wall, a ruined fort or a rugged terrain as a backdrop. A two-wheeler with some characters like Royal Enfield or Harley Davidson is an absolute must in this type of photography. For the attire, rely on leather jackets, denim shorts with a long shirt, peasant tops, and boots. Colorful bandanas, aviators, and chunky jewelry go a long way in creating the look. Lastly, carry a backpack in some shots to give that boho feel. All said and done, make sure you enjoy your shoot to the fullest. This will help the photographer in capturing your true emotions and in crafting your personal story about love.